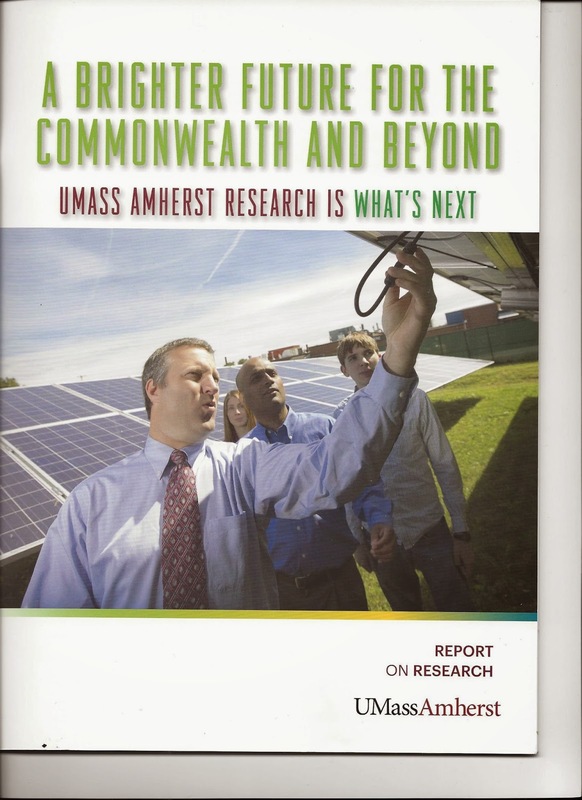 Today, I received the hardcopy of the UMass Amherst Annual Report on Research, which is an elegantly produced and very informative report, thanks to the Editor, Karen J. Hayes. The report begins with a message from our Vice Chancellor for Research & Engagement (VCRE), Dr. Mike Malone, who also is the Ronnie & Eugene Isenberg Distinguished Professor of Engineering. Research awards topped $165.5 million this year, which is quite impressive. 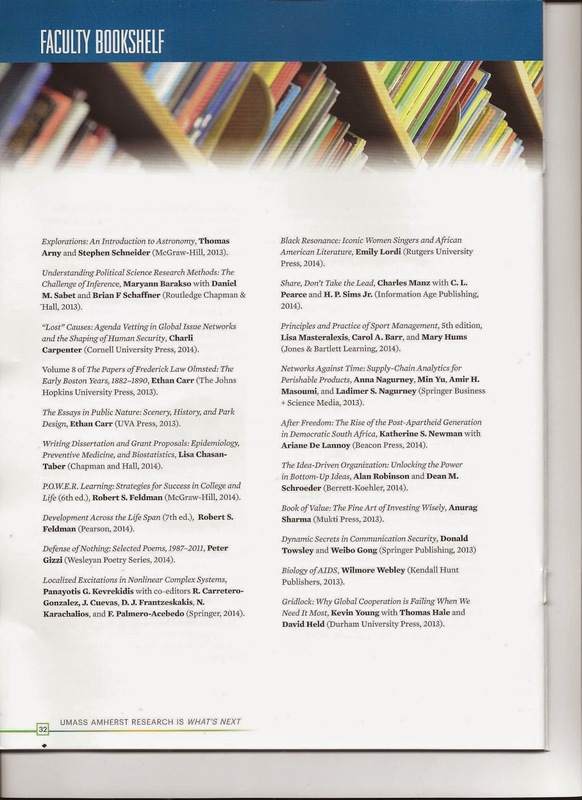 In the report is a segment called Faculty Bookshelf, which I always enjoy browsing through, and this year, 5 out of the 20 books featured are by Isenberg School of Management faculty! We have certainly been busy. It was great to see our book, "Networks Against Time: Supply Chain Analytics for Perishable Products," written with two of my former doctoral students, Professor Min Yu of the University of Portland and Professor Amir H. Masoumi of Manhattan College, and with Professor Ladimer S, Nagurney (the other Professor Nagurney). And, just below our book, is the new book by our great new Provost, Dr. Katherine S. Newman! 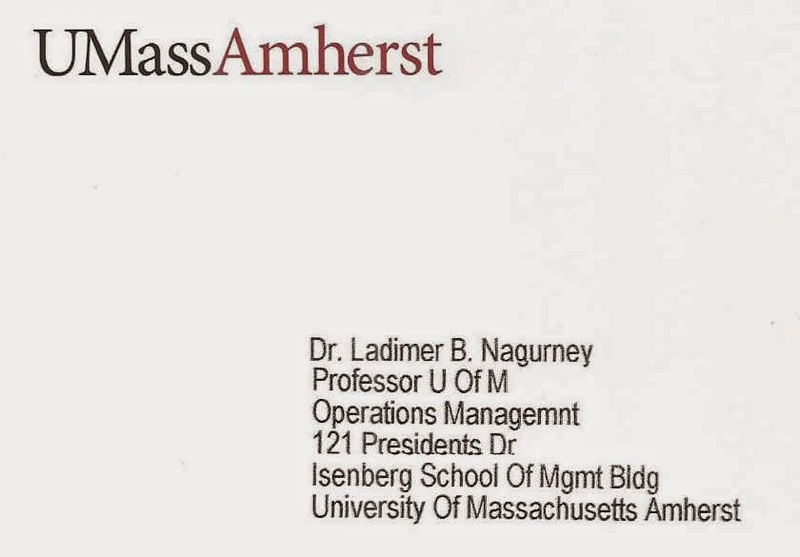 Somehow the report made it to my Isenberg School mailbox although it was addressed to my husband who seems to be in the UMass database as a faculty member in my department (not true)! Also, in the Annual Report is a feature on Incubating Innovation, in which the Isenberg Scholar Award recipients for 2014 are noted with an interview with my doctoral student, Sara Saberi and photo included. The online version appeared earlier on the ResearchNext website - thanks! Congrats to all thirteen 2014 Isenberg Scholar Award recipients, an award which comes with a $10,000 fellowship! In addition to Sara, two other recipients are from my department and are doctoral students in Management Science - quite exceptional - David Agogo and Yueran Zhuo. I also mention Michael Prokle, from Mechanical and Industrial Engineering, since although he is not one of our grad students, he is the President of our UMass Amherst INFORMS Student Chapter, so he is definitely part of the Isenberg School "family." This has been quite the week with winterstorm Juno resulting in the cancellation of over 7,000 flights in the U.S.
Today, UMass Amherst and many other universities and colleges were closed in the Northeast because of what was forecast to be a blizzard of historical proportions but, luckily, it did not quite earn that title in either NYC or Boston and we even managed to go out for a nice walk in Amherst once our driveway and street got plowed! The beautiful island of Nantucket, however, did get hit fiercely and is without power. This week was also the week in which we had scheduled interviews of 4 candidates for a faculty position in my department. One managed to make it to the interview that took place yesterday but did not get out, as planned. The interviews for today and tomorrow got cancelled but they have been rescheduled for next week. Another candidate will be interviewed this Friday and we don't expect any delays due to weather. It's been quite a bad winter in terms of travel to interviews. One of my doctoral students who is on the job market had major delays on one of her itineraries to a campus interview and arrived a day late (so much for showing up on time but these are matters beyond one's control). And, yes, the delays were at Chicago O'Hare where she ended up overnighting. On another interview trip of hers she arrived at 1AM, which was 4AM her body time since the destination was California. She managed the interviews but then her presentation got rescheduled 2 days afterwards - this is a new one for me - so it will have been a 5 day span rather than a 3 day span for the interview and visit! Clearly, faculty job candidates need to be resilient! The interview itself may take two days, under the "easiest" of circumstances and one needs endurance from the breakfast meetings to dinners that can linger plus numerous meetings with faculty, administrators, including deans, and even staff. One has to be energetic, positive, and enthusiastic because the department is looking for a colleague and you are also being evaluated on how good of a fit you will be in terms of research, teaching, service, and collegiality! It so happens that, at least in the fields of operations management and also operations research and management science many of the on-campus interviews take place in December, January, and February so there may always be issues with weather. I recall a few years back when we were searching for faculty for 2 positions in my department and I was co-chairing the search committees. We brought 7 candidates in to the Isenberg School over 2 weeks in December and one of those candidates was here during a blizzard, when UMass closed. But, luckily, the University Club stayed open for us so that we could host him for a nice lunch! And, since he was originally from a region close to Siberia, he loved the snow! One of my very successful former doctoral students (I have had quite a few of them), Dr. Jose M. Cruz, who is now an Associate Professor at the School of Business at the University of Connecticut and is also the Director of its great Master's Program in Business Analytics and Project Management, gave a great talk a few years ago in our INFORMS Speaker Series. 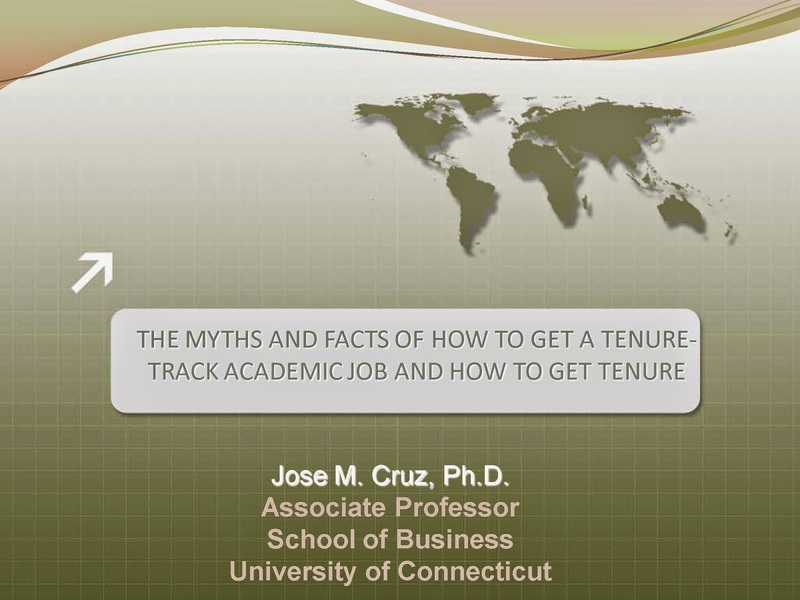 The title of his talk was:"The Myths and Facts of How to Get a Tenure Track Academic Job and How to Get Tenure" . There are wonderful tips in the presentation to make your interview more pleasant for you and for the those who are interviewing you! 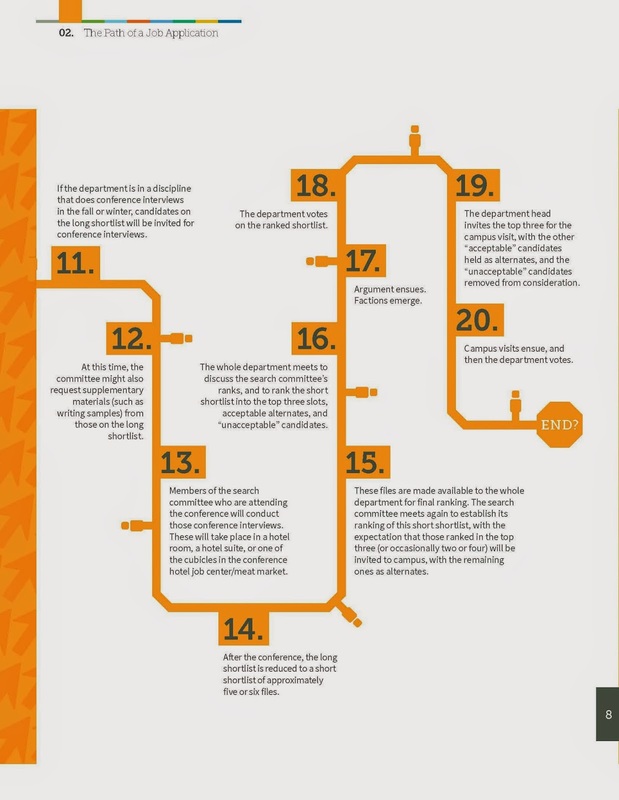 Also, The Chronicle of Higher Education produced a document, "The Quick and Relatively Painless Guide to Your Academic Job Search," which is free and you can access it through here. The guide is written by Dr. Karen Kelsky and it is excellent. 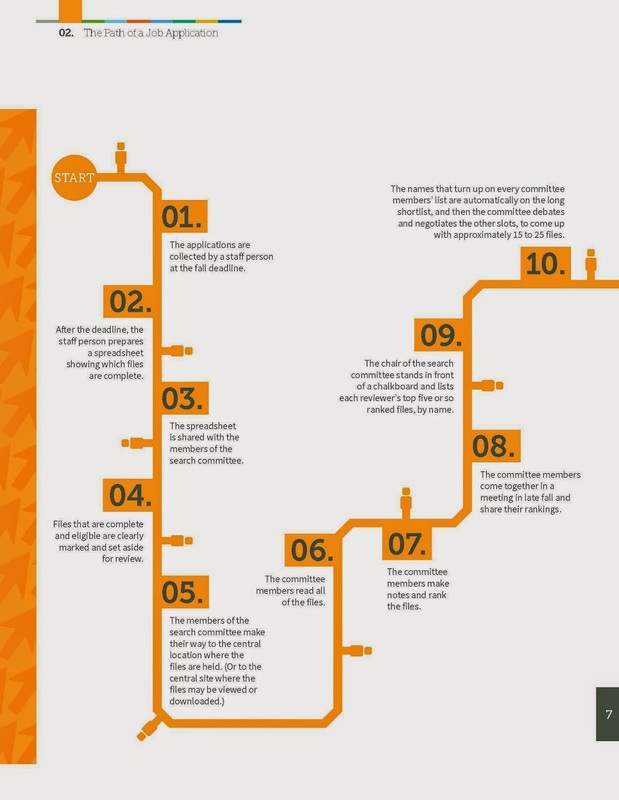 The document contains nice graphics including those below illustrating the path of a job application. Although it states that usually 3 candidates are brought to campus, I know that in fields of business, we usually bring 4 and, last year, when I served on the Search Committee for a faculty opening in the Department of Mechanical and Industrial Engineering at UMass, we brought in 5 candidates and we were dealing with ice storms, snowstorms - you get the drill! Best of luck to all those on the academic job market and I hope that you find the above resources helpful. Last week was the first week of the new academic semester at UMass Amherst and it was a very exciting one. I always very much enjoy meeting new students in the courses that I am teaching. Plus, it was a great week for news on our research on Networks. One of the best things about collaborations, besides the synergy and dynamism of researching tough problems together, is that, when one gets good news, such as a paper getting accepted, or hearing of its publication, and/or some great publicity about the work, you can share it and celebrate together - even if it is across the miles! This week, Luis Marentes, who was a visiting doctoral student in the College of Engineering at UMass Amherst last year, and who is from Colombia, Professor Tilman Wolf (who was his host), and with whom I have a large NSF grant, and Professors Yezid Donoso and Harold Castro of the Department of Systems and Computing Engineering, Universidad de los Andes in Bogota, Colombia, and I had our paper, "Overcoming Economic Challenges of Internet Operators in Low Income Regions through a Delay Tolerant Architecture with Mechanic Backhauls," appear online in the journal Netnomics. It was great to share in the happiness of all those involved in this publication, which is on the dynamic pricing of Delay Tolerant Networks, and proposes a new computer architecture. To-date, there has been minimal work on the pricing in this domain and the identification of the potential profitability of Internet Service Providers in poor, and, often, rural communities, where even mechanic (even in the form of mule transportation) may be used to transport Internet information. Also, our paper, "Securing the Sustainability of Global Medical Nuclear Supply Chains Through Economic Cost Recovery, Risk Management, and Optimization," co-authored with Professor Ladimer S. Nagurney of the University of Hartford and my doctoral student, Dong "Michelle" Li, appeared this week in the special issue of the International Journal of Sustainable Transportation devoted to Sustainability in Transportation Networks. The paper was accepted for publication close to 3 years ago so it was nice to see it officially in the journal volume! The first paper above has 5 co-authors, the second one has 3, and the one below only one (but ensuing ones on cybersecurity will have co-authors). Specifically, the paper, "A Multiproduct Network Economic Model of Cybercrime in Financial Services, that I wrote after our very successful Advanced Cyber Security Workshop at the MIT Sloan School last Fall, received very nice reviews from an INFORMS journal, and it has been revised and resubmitted. In the Acknowledgments I also thank the audience who came to my presentation at the Boston INFORMS Analytics conference in Spring 2014, which was a fabulous conference! Another highlight this past week was having our NSF project: Network Innovation Through Choice, which we are calling ChoiceNet, and for which Professor Wolf and I are PI and Co-PI (along with 5 other Co-PIs from the University of Kentucky, NCState, and the Renaissance Institute (RENCI) at UNC) being featured on the UMass Amherst Research website in Research Next. And the article, Internext, UMass Amherst experts are driving the future of Internet infrastructure, will appear in the 2014 UMass Amherst Annual Report on Research which will be available, I am told, by the end of this month. This should be a very exciting week as well with many interview candidates coming both to the Isenberg School and to UMass and with a major snowstorm forecast for early this week! Today is the first class meeting for my course, Humanitarian Logistics and Healthcare, a course that I taught last year at the Isenberg School. I have also taught an intense version of this course at the Vienna University of Economics and Business in Austria and have been invited to offer it there again. Logistics is one of my passions and Humanitarian Logistics is a subject that is not only extremely timely but also very challenging from multiple perspectives. Hence, it is a topic that is interdisciplinary and is continuing to evolve. An important, and much appreciated part of the course, by both students (and me), is the experts that I bring in to speak to the class. We all come prepared with many questions and benefit greatly from the speakers' expertise on the front lines. frontlines of the Ebola crisis in Liberia with Doctors Without Borders. and Business Continuity at UMass Amherst. Preparedness Coordinator at Cooley Dickinson Hospital. Ms. Kim Goulette, Executive Director of the Pioneer Valley Chapter of the American Red Cross. We are so grateful and appreciative to all the above experts for the time that they take out of their very busy schedules to come to the Isenberg School to share their experiences and lessons learnes with us! I am looking forward to a very exciting class and a great semester! I was delighted to hear this morning from Karen Hayes, the Director of Research Communications and Outreach, that the Feature Article, UMass Amherst experts are driving the future of Internet infrastructure, is now online on the ResearchNext website. The faculty from Computer Science and Electrical and Computer Engineering and the Isenberg School of Management that appear in the article were interviewed last summer. It is truly amazing that at UMass Amherst there are two (out of the five) funded National Science Foundation (NSF) Future Internet Architecture (FIA) projects. As the article notes, my doctoral students and I are working with Professor Tilman Wolf of the Department of Electrical and Computer Engineering on the FIA project that we are calling ChoiceNet. Our collaborators include colleagues at the University of Kentucky (Professors Ken Calvert and Jim Griffioen), NCState (Professors Rudra Duuta and George Rouskas), and RENCI an UNC (Dr. Ilya Baldine). My doctoral students who have been funded on this NSF grant are: Sara Saberi, who is an Isenberg Scholar Award recipient, and Dong "Michelle" Li, who received the Outstanding Doctoral Student Researcher Award from the Isenberg School in 2014. Both Sara and Michelle are PhD students in the Management Science track at the Isenberg School. Just last week, I spoke at the INFORMS Computing Society conference on our latest research on ChoiceNet in the form of introducing duration-based contracts for Internet services so as to offer consumers more choices. 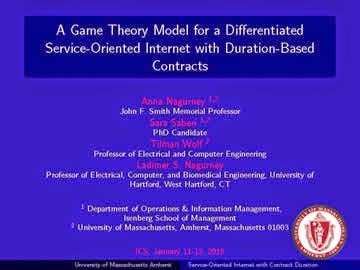 The paper, which is online, thanks to INFORMS and the great conference Proceedngs editors, is: A Game Theory Model for a Differentiated Service-Oriented Internet with Duration-Based Contracts, Anna Nagurney, Sara Saberi, Tilman Wolf, and Ladimer S. Nagurney, Proceedings of ICS 2015: Operations Research and Computing: Algorithms and Software for Analytics, Brian Borchers, J. Paul Brooks, and Laura McLay, Editors, INFORMS (2015) pp 15-29. Our presentation can be viewed here. The project page for ChoiceNet is here where you can find some of our papers. In addition to ChoiceNet, the other FIA project that UMass Amherst researchers are involved in is MobilityFirst. Professors Jim Kurose, Arun Venkataramani, and Michael Zink are working on that project. And, for those who have not heard, Distinguished University Professor Jim Kurose of Computer Science is now the new Program Director of CISE (Computer & Information Science & Engineering) Directorate at NSF! Today marks the completion of 6 years of writing on this blog, which I started back on January 19, 2009, with a new administration and the New Year. It has been a terrific journey and I thank all of my readers who have extended their appreciation for my posts. I continue to believe that there is still much to be said, celebrated, and commented on so I look forward to continuing to write on this blog. I have tried to provide tips for academic job seekers, for researchers, as well as for students, and to acknowledge achievements of both students and faculty and those who make a difference in people's lives. I have also tried my best to recognize those who have been great mentors, educators, and leaders. Research has also been a consistent, very important topic on this blog, RENeW (Research, Education, Networks and the World) as well as travel experiences and observations on academic lifestyles in different countries, Sweden included. I have tried to include photos in may posts as well as useful links. And today, as we celebrate Martin Luther King's Day, I recognize the importance of having different voices and perspectives heard and acknowledged. Looking forward to a great new semester, which begins at UMass tomorrow! Last year I had the pleasure of attending the Inaugural Women of Isenberg Conference, which I enjoyed immensely. This year's conference takes place on February 7, 2015 at the Isenberg School of Management. 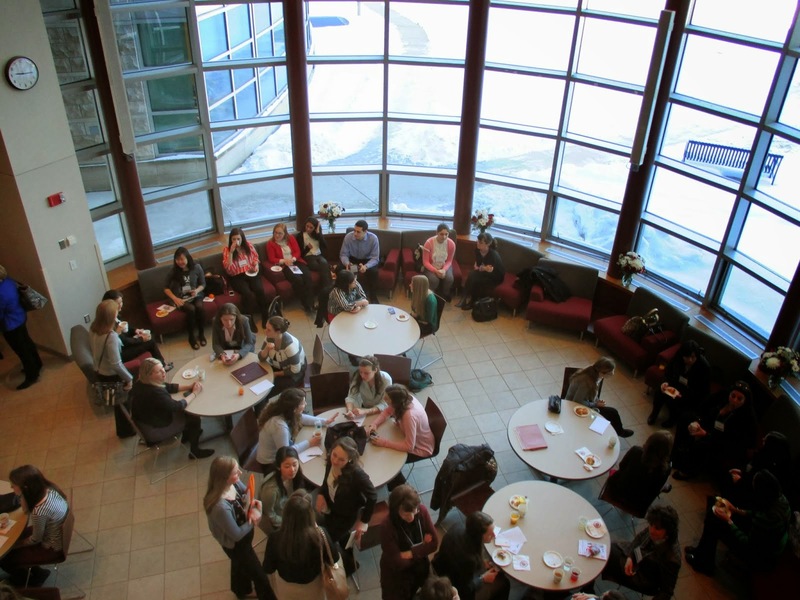 The Isenberg Women in Business Society organizes this annual conference and brings together students, alums, faculty, and women from different fields of business and backgrounds to share their experiences about being women in the workplace. The weaving thread is being a woman of Isenberg. The organizers have put together a program of 2 keynote speakers, 9 different panels, and a networking luncheon plus a meet and greet with corporate sponsors. I am very much looking forward to being a panelist this year on the Building Your Brand panel. Links to the panels and speaker info can be found below. The organizers have done a great job promoting the event and identifying a nice cross-section of speakers and panelists. Thanks to the sponsors and to all those involved. Hope to see many of you at this important winter event! The INFORMS Computing Society Conference Was Terrific! I hope that all that attended the INFORMS Computing Society Conference, which ended yesterday, made it home back safely! I'd like to thank the organizing committee for such a great conference. The venue at the Omni hotel in Richmond, Virgina made for a convenient location, great socializing, and fabulous plenary talks and tutorials plus sessions. I was pleased that three of our doctoral students at the Isenberg School of Management, Tulay Flammand, Heng Chen, and my student, Sara Saberi, got a chance to present their work there and to do some serious networking. It was great to reconnect with many wonderful colleagues - I capture only some of them in the photos here. It was fun to also meet new people, including one of the plenary speakers, Richard Stallman of the Free Software Foundation, with whom I shared a taxi to the Richmond airport after the conference. (On the way to the conference I shared a cab from the airport with Sheldon Jacobson.) The full conference program and the conference Proceedings can be downloaded here. The hotel was close to the State House with a minipark and only 2 blocks from the river walk. And I will make good use of my conference souvenir umbrella, which was a challenge carrying on the two-legged flights but everyone got to hear how it was a souvenir from the INFORMS Computing Society conference. Thanks, again, to the organizers and to the speakers for the great intellectual stimulation and fun! Having a conference such as the 2015 INFORMS Computing Society Conference, which takes place in Richmond, Virgina, January 11-13, 2015, is a treat. The theme of the conference is: Operations Research and Computing: Algorithms and Software for Analytics. The timing of the conference is convenient for faculty and students since it is taking place during the winter break between academic semesters. I have packed up my suitcase and briefcase and will soon be heading to the airport. The weather in Richmond is much milder than here in western Massachusetts so that will make the conference pleasant as well. The conference organizing committee and the stream chairs did a terrific job putting the program together There will be many methodological sessions as well as application-based ones - I am especially interested in the network applications, the homeland security, and the health applications tracks. There is also a marvelous lineup of plenary speakers and tutorial speakers. The first plenary speaker is Professor George Nemhauser of Georgia Tech, tomorrow morning - a talk not to be missed. The program and the Proceedings can be downloaded from this page. On Tuesday morning, in a session in the Network Applications track, I will be presenting a paper, with assistance from my doctoral student, Sara Saberi, entitled: "A Game Theory Model for a Differentiated Service-Oriented Internet with Duration-Based Contracts." This paper is joint with also Professor Tilman Wolf of the College of Engineering at UMass Amherst and Professor Ladimer S. Nagurney from the Department of Electrical and Computer Engineering at the University of Hartford. Our paper can be accessed from the online Proceedings, compliments of INFORMS. Many thanks to the Editors of this volume: Drs. Brian Borchers, J. Paul Brooks, and Laura McLay! Our presentation can be downloaded from the Supernetwork Center site here. Looking forward to seeing many INFORMS Computing Society members soon in Richmond, Virginia! I have been enjoying working on my lectures for my SCH-MGMT 597LG - Humanitarian Logistics and Healthcare course during this winter break. I will be offering this course for the third time at the Isenberg School of Management (and have even taught a very condensed version of it at the Vienna University of Economics and Business while I was on sabbatical). Critical Needs Supply Chains Under Disruptions. The course attracts students from the Isenberg School of Management, the School of Public Health, and the College of Engineering. Experts who are practitioners in the subject domain provide the students (and me) with deep insights and personal experiences. Last year, we benefited from lectures by Mr. Rick Lee of the Red Cross, who has since retired, and who made a lasting impact on this organization and numerous people through his 30 years with this organization, and from Dr. Pierre Rouzier, our UMass sports team physician, who spoke on his efforts during the Boston Marathon bombing to save lives and post the Haitian earthquake. We also had the pleasure of hearing from Mr. Jeff Hescock, the Director of University Emergency Management and Business Continuity, We heard from Mr. Dave Madsen, a renowned news broadcaster in western MA with over 40 years of experience. In addition, my husband, Professor Ladimer S. Nagurney, spoke on disaster communications. An Integrated Disaster Relief Supply Chain Network Model with Time Targets and Demand Uncertainty, Anna Nagurney, Amir H. Masoumi, and Min Yu, in Regional Science Matters: Studies Dedicated to Walter Isard, P. Nijkamp, A. Rose, and K. Kourtit, Editors, Springer International Publishing Switzerland (2015), pp 287-318. This book volume also contains a paper by the Nobel laureate in Economics, Professor Paul Krugman. We were so inspired by the speakers and the value that they added to the course and the students' knowledge that I wrote a Guest Editorial about these "Hometown Heroes." This year, we will also be covering the Ebola crisis in western Africa, and the lessons learned. I'll be periodically blogging about this course and the speakers this year, so do stay tuned and stay warm! In at the Beginnings with Philip M. Morse, the Father of Operations Research in the U.S. I very much enjoyed the plenary lecture that the Morse Award winner Professor Dimitris Bertsimas of the Sloan School at MIT gave at the San Francisco INFORMS Meeting this past November. Paul Rubin wrote a nice blogpost on it. In his lecture, Dimitris noted that he, from time to time, rereads the autobiographical book by Philip M. Morse, after whom the award is named. The book is, "In at the Beginnings: A Physicist's Life" and it was published by MIT Press in 1977. So, during this winter break, while revising a paper and finishing up two papers, after the holiday celebrations, I found time to read the book, which my husband had a copy of. My husband has a PhD in physics, as did Morse. The below photos are taken from the book and I was excited to see one female featured but that was at a ceremonial dinner of the Japanese Union of Scientists and Engineers (JUSE). Morse was born in 1903 and, after receiving his PhD from Princeton in 1929, joined the physics faculty at MIT. He was drawn to Operations Research (OR) during World War II. The title of Morse's book is perfect, because he was truly at the beginnings of many important organizations and events, from the establishment of the Anti-Submarine Warfare Operations Research Group during World War II to the founding of the Operations Research Center at MIT. I had met Philip Morse when my husband and I were grad students at Brown University and Professor Bob Beyer, of acoustics fame, invited us to a reception of the Acoustical Society, which was having its meeting in town and we were introduced to Morse. Interestingly, my industrial jobs, while pursuing my Master's in Applied Math at Brown, were in technical consulting for the naval submarine sector in Newport, Rhode Island. My very first project involved developing software in AN-UYK assembly language for submarine transiting so that the enemy would not be able to detect the submraines via sonar. Hence, I enjoyed the chapters of the Morse book that described the scientific challenges of the wartime efforts. Reading his autobiography was very special, I must say. I am also a big fan of the Operations Research Center at MIT since I had an NSF Visiting Professorship there and organized a speaker series to bring outstanding females in OR to speak. Morse was an amazing scientist, contributing to both physics and to the, at that time, still young, but growing, discipline of Operations Research, which he was passionate about and used his extensive network of friends and contacts to promote, whether in Washington or in Europe (including NATO and the OECD). He wrote glowingly about the founding of IFORS, the International Federation of Operations Research Societies, and its first meeting in 1957 in Oxford, followed by the conference (very successful) in Oslo. Also, Morse was the first President of ORSA, the Operations Research Society of America, the precursor to INFORMS. His doctoral student, John D.C. Little, renowned in OR, wrote a nice tribute in his honor, that was published in the journal Operations Research on its 50th anniversary. I enjoyed reading about how Morse was instrumental in promoting computers at MIT in the 1960s and also the challenges that he faced but, nevertheless, the Computation Center was established. I was delighted to hear him mention the role that Marvin Minsky played, who was then a young mathematician in computing and who was to become the founder of artificial intelligence. His daughter, Margaret, is a neighbor of mine in Amherst and his son and my daughter graduated Deerfield Academy together. I saw Marvin last time at the graduation festivities. In his autobiography, Morse talks about the joys of teaching and of conducting research. On page 66, he states: "the devising of a new theory, or even the extension of a known one, is exploration, with all the excitement and trials and false starts and effort of any exploration. It is somewhat like putting together an intricate jigsaw puzzle." On page 119, he write: "I have always learned new subjects quickly; perhaps breadth rather than depth was best for me. .. Perhaps the most interesting life results from following one's interests, wherever it leads, rather than by assuming some rigid set of obligations, self-imposed or set by others." Morse was an explorer in the truest sense of the word. Morse was a voracious reader, reading 4 to 5 books a week, with many in the humanities. He considered his books, both those in physics and in operations research, as some of his greatest publications. Another favorite quote from the book appears in page 318: "The delights of research in O/R (he used the slash) are multiple. To me the pleasure coming from understanding how traffic behaves is as great as that coming from understanding how two atoms combine. In addition, the practical applications of O/R theory are often immediate and satisfying." I could very much relate to his fascination with traffic, a research topic that I have pursued since my graduate days at Brown working with Professor Stella Dafermos. In the next to the last chapter of the book, he writes about a request by the National Academy of Sciences in January 1962 by President John Kennedy to "evaluate and recommend research on behalf of the conservation and development of America's natural resources." The ultimate report identified 10 recommendations, including: to conduct research on pollution and its effect on man's total environment. However, once the report went through the review and publication processes, the President had been assassinated and the world had lost its stability. The final chapter ends with the following beautiful lines: "For those who like exploration, immersion in scientific research is not unsocial, is not dehumanizing; in fact, it is a lot of fun. And, in the end, if one is willing to grasp the opportunities, it can enable one to contribute something to human welfare." And physicists and operations researchers continue to tackle some of the most challenging problems today whether in terms of energy, pollution, or even healthcare. In March, I will be speaking in Berlin on "Design of Sustainable Supply Chains fr Sustainable Cities," at the Symposium (SOE/DY) Physics of Sustainability and Human-Nature Interactions, upon the invitation of physicists. Professor Morse's legacy lives on through all of us.